Memristor chaotic system has been attracted by many researchers because of the rich dynamical behaviors. However, some existed memristor chaotic systems have finite numbers of chaotic attractors. 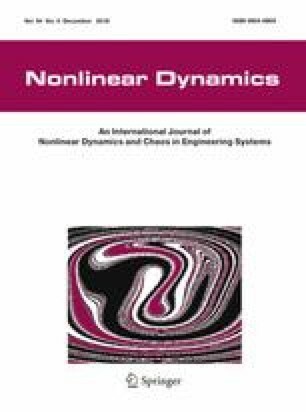 In this paper, a simple, effective method is given for designing the autonomous memristor chaotic systems of infinite chaotic attractors. Autonomous memristor chaotic systems are proposed from the start of memristor chaotic system counterparts. Three-dimensional, four-dimensional, and five-dimensional memristor chaotic systems are given in standard form with sine functions and tangent functions to prove the effectiveness of this method. Eventually, an analog circuit of three-dimensional memristor chaotic system is designed and implemented to prove its feasibility. The work is supported by the State Key Program of National Natural Science of China (Grant No. 61632002), the National Key R and D Program of China for International S and T Cooperation Projects (No. 2017YFE0103900), the National Natural Science of China (Grant Nos. 61603348, 61775198, 61603347, 61572446, 61472372), Science and Technology Innovation Talents Henan Province (Grant No. 174200510012), Research Program of Henan Province (Grant Nos. 172102210066, 17A120005, 182102210160), Youth Talent Lifting Project of Henan Province and the Science Foundation of for Doctorate Research of Zhengzhou University of Light Industry (Grant No. 2014BSJJ044).